Recently, Beautyhabit sent me a gift with purchase. It sent a message: Support a "Voting America." 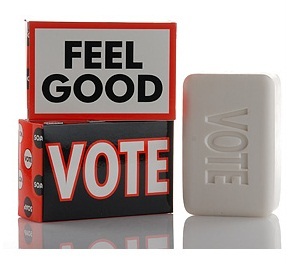 With a clean olive branch fragrance, the Vote Soap is vegetable-based and ultra-mild. Its base was created with organic aloe vera. I'm feeling a bit guilty since I didn't vote in yesterday's Virginia Primary. Up for grabs were the nominations for candidates for the House of Representatives and Senate from Virginia. The outcomes seemed preordained, and, uncharacteristically, I didn't vote. I had too much to do. I will certainly vote in this fall's general election. It's out duty to vote, and this fall, the choices could not be more different. Will you vote? Vote Soap is intended to serve as a reminder that our votes count. It would make a great campaign handout! Statement Soaps ($9) offers a variety of "statements," and they are all different. Actually, they are fun. Vote Soap? Take a shower with this soap - it's good for you - so is your vote - so do both! From Hope Soap to Love Soap, there's a message for everyone. Each Statement Soap features a message and a different fragrance. I would love to try Dream Sea Salt Soap. Beautyhabit has piqued my interest. Vote Soap has a light fragrance that's almost imperceptible, a bit like unscented Dove. The bar is humongous, almost too big for me to handle. In the shower, it's nice and creamy after a short introduction to water, and I love using it. I'll be bummed when it's gone. The next time I want a "filler" to round out an order at Beautyhabit to earn free shipping, the Statement Soaps will be on my list. Care about the ingredients? Beautyhabit makes them available online. Here are the ingredients for Vote Soap. I thought yesterday was only a Republican primary in VA, and I don't know if it's open voting. Since I'm not a Republican, I didn't go. I haven't missed many elections since my 18th birthday - which was election day in 1998! Hi GOTV! Depending on your district, there was also a House primary (e.g., Moran vs. Shuttleworth). As expected in that race, the incumbent blew away his opposition. It's too bad incumbents have such an advantage. I really wanted Shuttleworth to win but knew Moran was too entrenched. Really don't like him and agree with you about incumbents. Hmph!